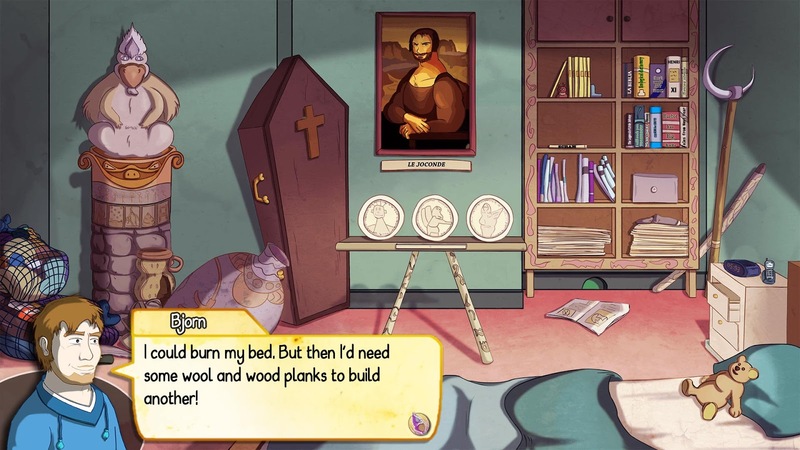 Demetrios - The BIG Cynical Adventure was yet again one of those games that came to my attention one day while scrolling through my Twitter timeline. 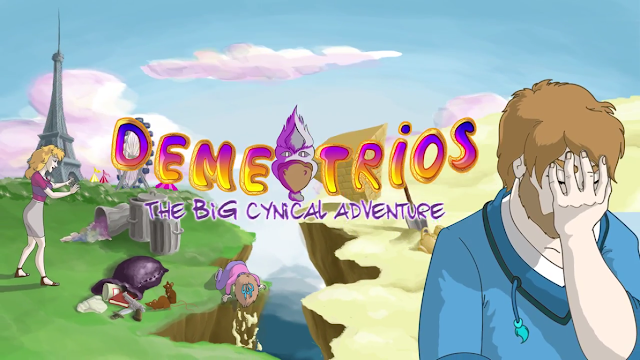 Billed as a quirky point and click adventure, Demetrios is certainly that, with them noted as also being inspired by a classic point & click adventure game, Broken Sword. I've never been a big point & click guy if truth be told, but I was looking forward to seeing what this was all about. You play a character called Bjorn Thonen, an antique dealer who lives in Paris who is robbed one hot July night after coming home on the tipsy side. A late night phone call tries to warn him of how much danger he is set to be in, but Bjorn is too drunk to care and falls back to sleep once the call is over. Later that night he is woken up by someone in his apartment only for them to knock him out cold until the next morning. Upon waking up the next day, he notices certain items have gone missing and with a useless local police force, you start to do your own detective work to find out who and why these people robbed you. While starting out the game in your apartment in Paris, as the chapters go on you do find yourself visiting other areas in Paris too, with later chapters seeing you jump on a plane to progress the story along. Police stations, your shop, hotels, weird underground bars, the game has it all. To progress the story along, you do so by completing small quests for people that you come across as you work your way through these chapters. These can be things such as hunting down items to disguise yourself as a police officer to gain access to somewhere, to getting items for a dinner that you neighbour wants to cook for you. It's all about working out where you could find the item you need and then working out how you can get your hands on them though, as most of the time they aren'y just handed to you. Take for instance when needing a photo ID to get into a bar to meet an important person. You have the ID with someone else's face on it and also your own ID with your picture in it, but no glue to stick it on with to fool them. This is when sick up your hotel door from a child who has decided to eat the only available glue stick comes in handy. Get stuck anywhere and the game has you covered with hidden cookies scattered around, with each area having three of them hidden away in weird places, and each cookie you eat giving you a hint on what to do next. On top of the that, the game also has multiple game over screens for you to work out and find.These can be something simple like sticking your finger into a plug socket in your bathroom, to being arrested for making copies of your bum on the photocopier in the police department. These just make you explore each area more as you try your best to find all of them for each chapter. 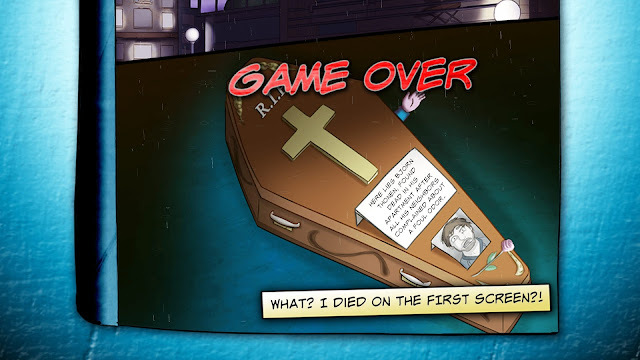 Overall: While the game is a point & click adventure, it can feel at times to throw a bit too much information at you via text, what with the game having zero voice over work put into it. There was a certain part later in the game where I felt like I was just reading text explaining the story to me for what felt like a good ten minutes, with me getting more and more bored of just pressing the A button as it just went on and on and one. It's been enjoyable to a degree, but I have reached a point now where I feel the simple story has started going on for way too long. For people who have enjoyed games like this is the past, Demetrios offers up everything you expect from a game in this genre. So you guys might get a bit more out of it. Quests never seem to differ, just the items you need to find.